As Blockbuster struggles, indie rental shops are fighting to hold on to customers and preserve a vanishing industry. How adequate is your health care coverage? 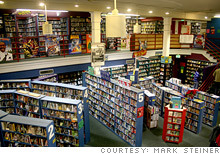 Seattle's Scarecrow Video stocks 100,000 movies, including offbeat and hard-to-find titles. NEW YORK (CNNMoney.com) -- The news this week that Blockbuster Video has hired advisors to explore "restructuring" options, which analysts say could include a bankruptcy filing, is bittersweet to the movie rental business's remaining indie stores. They're likely to outlive the corporate Goliath that once crushed scores of smaller retailers beneath its blue-and-yellow onslaught of identical chain stores. But the same forces that seem to have doomed Blockbuster (BBI, Fortune 500) - mail-order DVDs and streaming online video - may kill off the entire industry. 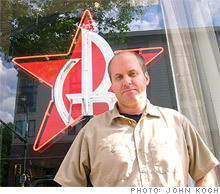 John Koch, the founder of Cinema Revolution in Minneapolis, is fighting on all fronts to keep his business going. Sales started softening in the middle of last year, when high gas prices kept people from making the drive out to his store. To compensate, he moved to a new location in Minneapolis, with a higher rent but also a more diverse and artistic community. Koch hopes his new neighbors will better appreciate his selection of foreign and cult films; he also provides a haven for local filmmakers who need a venue to screen their movies. "The move preempted some of the decline we started to feel in the summer when gas prices were high," says Koch. Still, sales are down 30% since January, a drop he attributes to the economy - and the Internet. Seattle's Scarecrow Video is also battling a sales drop. "We got hit in triplicate, with the recession, Netflix and online streaming, and snow - the storm on the last two weeks of December killed our Christmas season," says Mark Steiner, a buyer for the store. "And what are we doing? You can throw a million ideas out there, and you won't get folks out of their homes. They're hibernating." Like many of the video stores left standing, Scarecrow stocks its 100,000-title inventory with offbeat offerings not available through mass-market rivals. Steiner's staff tracks down obscure filmmakers who don't sell to distributors to negotiate a sales channel through his shop. If more Blockbuster outlets in Seattle close, Scarecrow may pick up foot traffic, but Steiner isn't looking forward to it. "Closings are never a good thing," he says. "Any time there's less people, less places for folks to buy and rent movie from, I think that the industry is going to get hurt." "Once massive content is built online, these independent guys are going to suffer a bit," says Wade Holden, an analyst with SNL Kagan, a Charlottesville, Va., media research firm. "It's going to be difficult for them to succeed in an on-demand market. They don't have the capital or the infrastructure to put together some sort of video-on-demand service, like Netflix is doing." Still, industry observers see room for a few retailers to hang on. "DVD rental is still going to be an important part of the consumer home video option for the foreseeable future, and many of the independent shops are surviving," says Sean Bersell, a vice president at the Entertainment Merchants Association, a non-profit trade association. "They're doing it in several different ways." Mike Clark's Movie Madness, an 18-year-old indie landmark in Portland, Ore., lucked into one of its best marketing weapons. In 1995, Clark was the top bidder at an auction for the flowing, lavender dress worn by actress Diane Keaton in The Godfather: Part II. At first, Clark figured he'd simply given in to a strange impulse buy, but he was hooked. His collection of movie memorabilia has since grown to more than 100 pieces, including the nearly ill-fated baby pram from The Untouchables and a suit worn by Mike Myers in Austin Powers. He's used the costumes and props to turn his store, which stocks 70,000 titles and specializes in cult films, into a museum. "Lines get really long on Friday and Saturday nights," says Clark. "People love coming here to look at the museum and to rent movies; we're a pretty unique store." The marketing hook helped him add 9,000 new customers to his roster last year, which now includes 130,000 movie renters. Janet Marsh, the owner of 9th Street Video in Columbia, Mo., survives in part because of her location: Her shop is within walking distance of the state's largest university, providing her a steady stream of students and professors. Her 7,000 titles include niche offerings like documentaries on developing nations. Marsh recently relocated, moving two blocks from 9th Street to Hitt Street, to be in the same historic building as Ragtag Cinema, a theater that shows mostly independent and international films and plays a big role in the town's annual True/False Film Fest. "There are a lot of folks out there who just don't want the standard Hollywood movie fare," says Marsh, whose store features a section of movies shown at Ragtag. "I think that's what keeps us going - we don't get rid of things, we have classics, world cinema, etc. It's nice for folks to have choices." Alan's Alley Video in New York City, a 20-year old stalwart founded by Alan Sklar, has found additional revenue by growing its corporate client base. For a fee, Alan's will provide copies of old movies and documentaries to ad agencies and TV networks when they need clips to run in the news or for in-house jobs. He also provides copy services, to diversify his shop's sales. But even with that extra income, Sklar is resigned to the fact that someday soon, his market, like the music retail industry, will succumb to the Internet-centric firms. "We've lost sales to downloads and to Netflix, and I think we're competing for folks' time as they browse the Internet and watch YouTube clips," he says. "For record and video stores, it's going to be difficult to have society move away from personality-driven services and more to a less-personal style of having stuff come to your house." Do you still go the store to rent movies? Tell us about it.